"Intel does not have any competition whatsoever in the midrange and high-end (x86) server market". We came to that rather boring conclusion in our review of the Xeon E5-2600 v2. That date was September 2013. At the same time, the number of announcements and press releases about ARM server SoCs based on the new ARMv8 ISA were almost uncountable. AppliedMicro was announcing their 64-bit ARMv8 X-Gene back in late 2011. Calxeda sent us a real ARM-based server at the end of 2012. Texas Instruments, Cavium, AMD, Broadcom, and Qualcomm announced that they would be challenging Intel in the server market with ARM SoCs. Today, the first retail products have finally appeared in the HP Moonshot server. There has been no lack of muscular statements about the ARM Server SoCs. For example, Andrew Feldman, the founder of micro server pioneer Seamicro and the former head of the server department at AMD stated: "In the history of computers, smaller, lower-cost, and higher-volume CPUs have always won. ARM cores, with their low-power heritage in devices, should enable power-efficient server chips." One of the most infamous silicon valley insiders even went so far as to say, "ARM servers are currently steamroller-ing Intel in key high margin areas but for some reason the company is pretending they don’t exist." Rest assured, we will not stop at opinions and press releases. As people started talking specifications, we really got interested. Let's see how the Cavium Thunder-X, AppliedMicro X-Gene, Broadcom Vulcan, and AMD Opteron A1100 compare to the current and future Intel Server chips. We are working hard to get all these contenders in our lab, and we are having some success, but it is too soon for a full blown shoot out. Micro servers were the first the target of the ARM licensees. Typically, a discussion about Micro servers quickly turns into a wimpy versus brawny core debate. One of the reasons for that is that Seamicro, the inventor of the micro server, first entered the market with Atom CPUs. The second reason is that Calxeda, the pioneer of ARM based servers, had to work with the fact that the Cortex-A9 core was a wimpy core that could not deal with most server workloads. Wikipedia also associates micro servers with very low power SoCs: “Very low power and small size server based on System-on-Chip, typically centered around ARM processor”. Micro servers are typically associated with low end servers that serve static HTML, cache web objects, and/or function as slow storage servers. It's true that you will not find a 150W high-end Xeon inside a micro server, but that does not mean that micro servers are defined by low power SoCs. In fact, the most successful micro servers are based on 15-45W Xeon E3s. Seamicro, the pioneer of micro servers, clearly indicated that there was little interest in the low power Atom based systems, but that sales spiked once they integrated Xeon E3s. Currently micro servers are still a niche market. But micro servers are definitely not hype; they are here to stay, although we don't think they will be as dominant as rack servers or even blade servers in the near future. To understand why we would make such a bold statement, it is important to understand the real reason why micro servers exist. Let us go back to the past decade (2005-2010). Virtualization was (and is) embraced as the best way to make enterprises with many heterogeneous applications running on underutilized servers more efficient. RAM capacity and core counts shot up. Networking and storage lagged but caught up – more or less – as flash storage, 10 Gbit Ethernet, and SRIOV became available. But the trend to notice was that virtualization made servers more I/O feature rich: the number and speed of network NICs and PCI-e expansion slots for storage increased quickly. 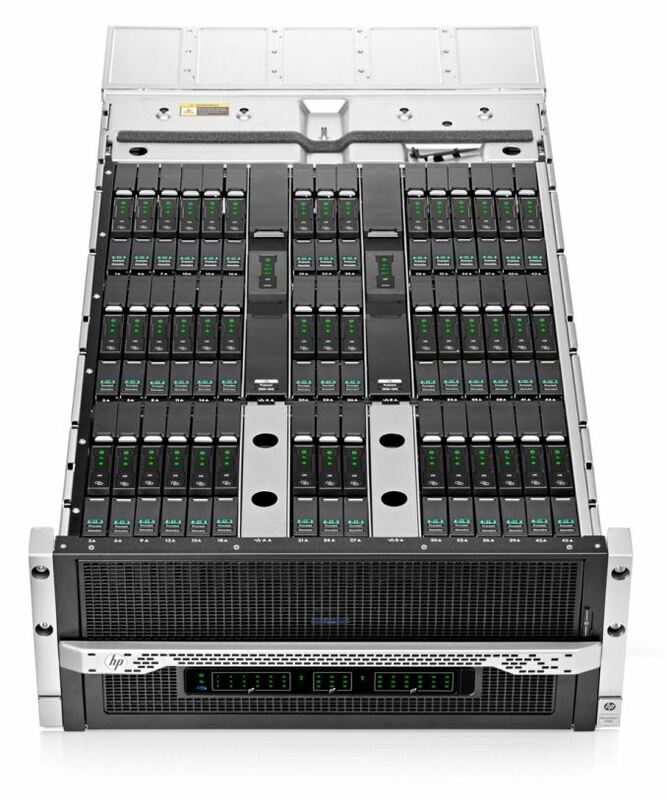 Servers based on the Xeon E5 and Opterons have become "software defined datacenters in a box" with virtual switching and storage. The main driver for buying complex servers with high processor counts and more I/O devices is simple: professionals want the benefits that highly integrated virtualization software brings. Faster provisioning, high availability (HA), live migration (vMotion), disaster recovery (DR), keeping old services alive (running on Windows 2000 for example): virtualization made everything so much easier. But what if you did not need those features because your application is spread among many servers and can take a few hardware outages? What if you do not need the complex hardware sharing features such as SRIOV and VT-d? The prime example is an application like Facebook, but quite a few smaller web farms are in a similar situation. If you do not need the features that come with enterprise virtualization software, you are just adding complexity and (consultancy/training) costs to your infrastructure. Unfortunately, as always, the industry analysts came with unrealistic high predictions for the new micro server market: in 2016, they would be 10% of the market, no less than "a 50 fold jump"! The simple truth is that there is a lot of demand for "non-virtualized" servers, but they do not all have to be as dense and low power as the micro servers inside the Boston Viridis. The "very low power", extremely dense micro servers with their very low power SoCs are not a good match for most workloads out there, with the exception of some storage and memcached machines. But there is a much larger market for servers denser than the current rack servers, but less complex and cheaper than the current blade servers, and there's a demand for systems with a relatively strong SoC, currently the SoCs with a TDP in the 20W-80W range. Not convinced? ARM and the ARM licensees are. The first thing that Lakshmi Mandyam, the director of ARM servers systems at ARM, emphasized when we talked to her is that ARM servers will be targeting scale-out servers, not just micro servers. The big difference is that micro servers are using (very) low power CPUs, while scale-out servers are just servers that can run lots and lots of threads in parallel. OK you devote another huge block of text to the typical x86 complexity myth* followed by: Oh, but the ARM chips are superior because they have special-purpose processors that overcome their complete lack of performance (both raw & performance per watt). Uhm... WTF?? I need to have a proprietary, poorly documented add-on processor to make my software work well now? How is that a "standard"? How is requiring a proprietary add-on processor that's not part of any standard and requires boatloads of software cruft working in a "reduced instruction set architecture" exactly? I might as well take the AVX instruction set for modern x86... which is leagues ahead of anything that ARM has available, and say that x86 is now a "RISC" architecture because the AVX part of x86 is just as clean or cleaner than anything ARM has. I'll just conveniently forget about the rest of x86 just like the ARM guys conveniently forget about all the non-standard "application accelerators" that are required to actually make their chips compete with last-year's Atoms. The coprocessor idea is something stems from mainframe philosophy. Historically things like IO requests and encryption were always handled by coprocessors in this market. The reason coprocessors faded away outside of the mainframe market is that it was generally cheaper to do a software implementation. Now with power consumption being more critical than ever, coprocessors are seen as a means to lower overall platform power while increasing performance. Of course additional power draw for more complex instruction deconding mattes in servers: today they are driven by power-efficiency! The transistors may not matter as much, but in a multi-core environment they add up. Using the quoted statement from AMD of "only 10% more transistors" means one could place 11 RISC cores in the same area for the same cost as 10 otherwise identical x86 cores. Johan said it perfectly with "the ISA is not a game changer, but it matters". And you completely misunderstood him regarding the accelerators. Intel is producing "CPUs for everyone" and hence only providing few accelerators or special instructions. In the ARM ecosystem it's obvious that vendors are searching niches and are willing to provide custom solutions for it - hence the chance is far higher that they provide some accelerator which might be game-changing for some applications. This doesn't mean the architecture has to rely entirely on them, neither does it mean they have to be undocumented. The accelerators do not even have to be faster than software solutions, as long as they're easy enough to work with and provide significant power savings. Intel is doing just that with special-purpose hardware in their own GPUs. What's with all the unnecessary piss and vinegar? All CPU vendors rely increasingly on specialized silicon, newer Intel CPUs feature special crypto instructions (AES-NI) and Quick Sync, for instance. Adding special purpose hardware to augment the system (in the past usually done for performance reasons) is quite old, just think of hardware RAID cards and video »accelerators« (which are not called GPUs). The reason that Intel doesn't add more and more of these is that they build general purpose CPUs which are not optimized for a specific workload (the article gives a few examples). In other environments (servers, mobile) the workload is much more clearly defined, and you can indeed take advantage of accelerators. LOL! Most of the comments here like this one seem to be written by people who think computers should all be like gaming machines or something. Here'a tip: no-one cares about "complexity," "standardization," "RISC," or anything else you mention. All they care about in the target market for ARM server chips is price, performance and power, and I mean ALL THREE. On this Intel cannot compete. They sell wildly overpriced legacy hardware propped up by massive R&D expenditures and they're wedded to that model. The rest of the industry is wedded to the new and cheap model. Just like how the industry moved to mobile devices and Intel stood still, this change will also wash over Intel while they sit still in denial.